Bluetooth is great for voice when talking on your mobile phone with headsets like the Plantronics Voyager PRO HD (see earlier post), and works nicely for wireless peripherals to use a mouse or keyboard with your laptop or tablet. But more and more Bluetooth is for music. At home you can go wireless with products like the Logitech Wireless Boombox (see post) or Logitech Wireless Headset (see post). So when you find yourself using your smartphone more as a music player than as a phone, then there's an obvious flaw with using a tiny Bluetooth headset in one ear to listen to two-channel stereo music. You can plug in wired earphones to enjoy your music when you're travelling or exercising, but they're clumsy to juggle between music and calls. Instead, check out the Jabra SPORT Bluetooth stereo headset, with a pair of earpieces that fit comfortably behind the ear, especially while you're in motion and sweating. The two earpieces are connected by a cord that runs behind your head, but the connection to your smartphone (or other media player) is Bluetooth wireless, so you can play music, with volume and skip controls, and switch over to pick up phone calls. 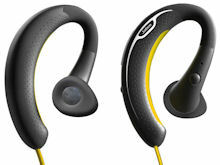 For playing streaming music, the SPORT features bass boost and Virtual Surround Sound audio enhancement. It also includes a built-in FM radio with auto-search, although you'll probably want to set it to one favorite station since skipping manually through stations without any visual feedback can be painful. And the SPORT is designed for workouts, with U.S. military grade rain, dust and shock protection and a wind-shielded microphone. It also includes a free download of the Endomondo Sports Tracker app that work with iPhone, Android, and BlackBerry smartphones as a motivational tool for running, updating your speed, distance, and times with GPS tracking. The Jabra SPORT Bluetooth stereo headset is available for around $99, and the companion non-wireless SPORT-CORDED stereo headset is around $69. No sweat. 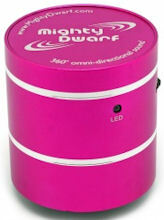 And see my Holiday Gadgets 2011: Portable and Wireless feature for more on Bluetooth headsets and other holiday goodies. 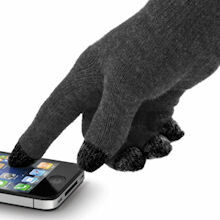 Baby it's cold outside -- But when you're wearing your mittens you can't control your iPhone or even answer a call. Today's touchscreens use capacitive screens, which detect your finger because your body is an electrical conductor. But mittens and gloves are insulators, so the screen does not respond when you're wearing them. The answer, then, is to weave conductive tread into the fingers of your gloves. For example, the Newer Tech NuTouch Gloves have conductive fiber woven into all ten fingertips -- and all around the finger, not just for the finger pad. You then can freely use your touch screen devices in the cold, and tap, swipe, scroll, and type with the tip or side of any finger. The NuTouch gloves are made from a soft cotton mix (52% cotton), and are relatively thin, so you also can use as liners with heavier gloves. They're available in a charcoal color for $19.99 ($13 street), sized from small to extra large. 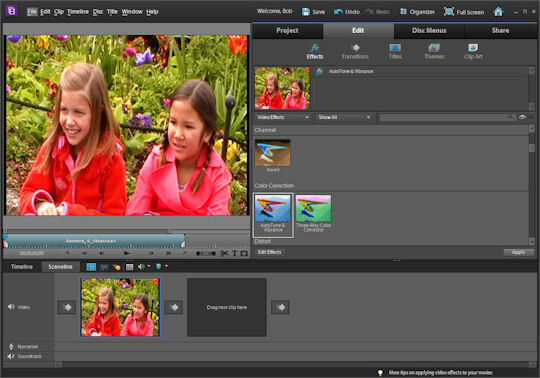 The tenth edition of Adobe's best-selling consumer video and photo editing products, Premiere Elements 10 and Photoshop Elements 10, continues Adobe's focus on providing deep technical power to create impressive results, but packaged behind a friendly interface and extensive automated assists (see post on previous version). Both Premiere Elements and Photoshop Elements include a separate common Organizer tool, used to import media files from various devices and then organize and tag them. You can also apply basic photo fixes and create photo albums, and share photos and videos directly online. 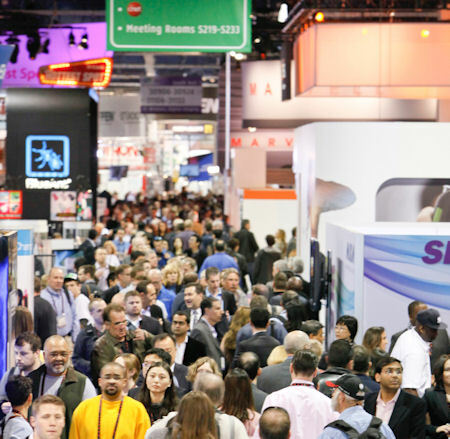 Then you can launch the individual applications for more extensive photo or video editing. The applications prove a consumer-friendly interface with tabs for different processing steps, plus how-tos and Guided Edit support. Plus, they apply enhanced technology from professional editing, including People Recognition in photos and the Three Way Color Corrector for video. However, these Elements applications are not for the casual user. They are designed for photo and video enthusiasts interested in investing effort to organize and manage your media with the assistance of automated analysis. This investment then pays off as you can leverage the media information to do a better job of finding the right clips and enhancing your productions. Entries posted to Manifest Tech Blog in January 2012, listed from oldest to newest.